Assisted suicide can be defined as the action whereby the person is helped by another individual to finally end up in his death. The term assistance is used here as death can be supported by any means including drugs or other equipments to cease life. This is considered as the right to death and is categorized under legal, illegal or undecided based on the jurisdiction as well as the culture of that particular region. Religious belief over suicide differs from one faith to another. It is considered as an unforgiveable sin resulting from confusion, unknown causes or despair in certain faiths. In certain parts of the world including Switzerland, Netherlands, Luxembourg, Belgium and three states of America consisting of Washington, Oregon and Montana assisted suicide is regarded as legal. Each jurisdiction has their own laws with different opinions on the same matter and many others with law suits and certain clause to finalize the same. In Canada, suicide is not a crime but physician aided suicide is of course an offence. 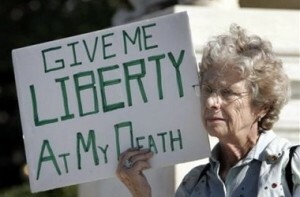 The legislation legalization supporters of assisted suicide talk about the freedom to die. They claim that every individual has the right to choose whether to live or not depending on his health conditions and if they are left to take an appropriate decision without harming others, what matters the rest of them? The majority who think this way opt for a suicide when they are in mental stress or other conditions to end their life. A famous proponent of assisted suicide was Jack Kevorkian. Have you thought about the others who are willing to die but are helpless without the assistance of others due to any illness, handicapped or other similar conditions? It is their right to die that must be brought into the limelight and their requests accepted to get rid of the immense suffering. They have absolutely no hope for the future and what they see is nothing other than degradation, more suffering, pain and fall. If merciful killing is what can bring happiness to their face, what is wrong in accepting their plea? Is it not cruel to let them suffer for the rest of their life? On the other hand, there are opponents talking about preserving and protecting life by the society considered as its ethical obligation. Assisting in another man's death flushes away any humanity that remains within the other individual thus violating the fundamental basics. The society is forced to protect and preserve the lives of each and every individual and not to destroy it. The people opposed to assisted suicide talk about the importance of why this law is not sanctioned. If mercy killing is allowed, what will be price of those on the bed? Does it mean that death is the only answer to those who are living in an undesirable or worthless condition? If we devalue another person's life, it is very clear that we devalue ours too. Assisted suicide is not accepted in a majority of nations thinking that the doctors and nurses will be put in terrible pressure to make this happen. It is clearly showcased that the value of a human is greatly deteriorated with assisted suicide and so it is very important to respect each and every life irrespective of the current condition. One way to avoid the risk of suicide is to stay physically and mentally healthy when you get older. Staying healthy is a must whatever your age is. This fact does not change because you have more wrinkles and grey hair. However, it is true that we experience more life changes such as retirement, loss of loved ones, career shifts, and physical manifestations of aging as the years go by. The key to staying healthy is to gracefully handle these changes. One of the best ways to handle aging is to look at change as part of life instead of a threat. In other words, it is a matter of reinventing yourself and finding new ways to feel connected to your loved ones and community. Remind yourself of the things that you are grateful for. Aging reminds us more and more of our mortality as we see friends and loved ones pass away or struggle with illnesses. This is one of the biggest sources of anxiety and stress in aging. Reminding yourself that all of these occurrences are part of life and that you should see it as a reminder to not take life for granted will help you enjoy what you have more. Open yourself to healthy ways of processing and expressing emotions. Depression, resentment, and anger are among the negative feelings that will eat you up from the inside. Instead of keeping it all in, consider talking to a trusted friend or expressing your thoughts in a journal. Be proactive in dealing with the everyday challenges of life. This means sweeping big problems under the rug or victimizing yourself will only rob you of your power. Instead of letting troubles to fester, take a proactive approach by finding solutions one step at a time. Most tips in staying vigorous and strong involve eating healthy and exercising regularly. These are definitely two of the basic steps in staying healthy after 50. Your physical health affects you mentally and emotionally. However, it is easy to slide back into an unhealthy lifestyle. Our modern environment has made us more susceptible to diseases caused by pollutants, stress, and unhealthy food. Most people live in autopilot as they find being healthy too tedious. Laughter is indeed the best medicine. Do not look too hard for the meaning of everything. Sometimes, a meaningful and joyful life means accepting its absurdities. Learning to laugh and not taking things too seriously is difficult at this point of your life. However, it is also the time to just enjoy things as they come. Reconnect with your younger self by rekindling an old hobby or trying out a new one. Remember how you always wanted to know more about pottery? Why not try taking classes and use that as an opportunity to meet and connect with new people. Eat healthy food and exercise regularly, eat plenty of vegetables and fruits, drink a daily smoothie made with fresh red berries, exercise regularly and sleep eight hours a day. Take time to play with your pets or grandchildren. Aside from being a physical exercise, being around young people and lively pets helps you feel more reinvigorated. The key to staying sharp and strong as you age is to try variations whether itâ€™s as simple as a new recipe or changing your routine. It will also help you feel good if you try something new each day. Do not think that itâ€™s too late to try things in your 50s. While perhaps there are limitations to what you can do physically, it doesnâ€™t mean you have to stop trying altogether. If you want to stay healthy after 50, you have to make a resolution not to give up on life. Instead, push through with your goals and start appreciating each day you spend with family and friends. It is always good to keep a positive attitude, while toning down the negativity that will drag you down and the people around you. Happy 50s!